VATICAN CITY—Claiming the religion was infringing upon His personality rights, Jesus Christ, the Light of the World, sued the Catholic Church Friday for alleged unlicensed use of His image. 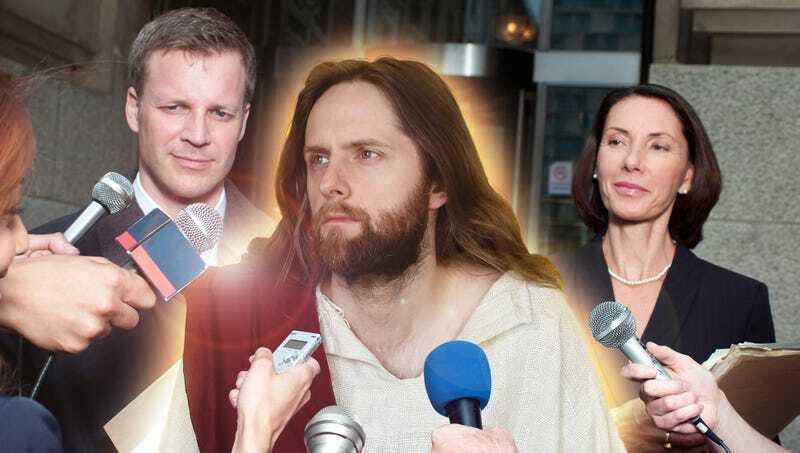 “Today, I have filed a lawsuit against the Roman Catholic Church for its unlawful appropriation of my likeness in their branding and promotional material,” said Christ, who in the case of King of Kings and Lord of Lords v. Vatican will argue that He hasn’t seen a cent since the Church started profiting off His image approximately 2,000 years ago. “I never signed off on, nor do I endorse, the sentiments behind any of these candles, plates, statues, paintings—none of it. I don’t want to have my brand devalued by a bunch of people just trying to turn a quick buck by slapping a reproduction of my wounded body on a cross.” At press time, sources confirmed the Church was attempting to reduce its legal exposure by altering its depictions of Jesus so they would instead feature short hair and a neatly trimmed mustache.